A Southern gambler hunts a killer in the thick of the first great battle of the Civil War. It's July 1861, and both the Union and Confederate armies expect to win the war within 24 hours. For Harrison Raines, a Southern dandy ensconced in DC society, it's time to choose a side. Though Raines loves Virginia, he hates slavery with a passion. And joining either army would mean leaving Washington and deserting the beautiful Caitlin Howard, a British actress whose heart, sadly, lies with the eccentric thespian John Wilkes Booth. For Caitlin's sake, Raines attempts to remain neutral in a time when neutrality means death. On the morning of the battle, Raines escorts Caitlin to watch the carnage firsthand. When the First Battle of Bull Run turns into a rout, he sees one major fighting to rally his troops - a major who is later found dead far behind Union lines, branded a deserter. To clear the dead man's reputation, Raines must solve a murder as bullets continue to fly. Murder at Manassas is the first book in the Harrison Raines Civil War Mysteries, but you may enjoy the series in any order. 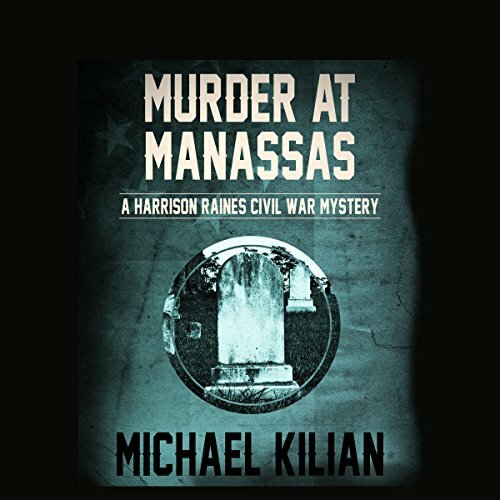 ©2000 Michael Kilian; This 2015 edition published by MysteriousP ress.com/Open Road Integrated Media, Inc. (P)2015 Audible, Inc.
What disappointed you about Murder at Manassas? The main character was neither intelligent nor particularly admirable. The storyline had promise, but the use of Booth in the story seemed contrived and the "twist" at the end was, imo, stupid. Either the main character was stupid regarding ballistics (and trajectories of bullets) or he was stupid in believing the tale provided him at the end. The "mother was a slave" scenario was equally contrived. None of the women seemed particularly intelligent, enterprising or even self sufficient. What could Michael Kilian have done to make this a more enjoyable book for you? Drop Booth or make him more of an opponent. Have the women be a bit more intelligent, truly enterprising and less inclined to hysterics and dosing themselves with laudanum. The main character drinks too much and is apparently unable to think rationally about any human with two X chromosomes. Being "gallant" is one thing. Stupid is another. What character would you cut from Murder at Manassas? Booth or one of the two actresses in love with Booth. The series has potential, but the protagonist was flatly annoying. He remains "neutral" until the end and really seems to join the Union only because he's compelled to. Bleah.